On Monday, Winter let us know it was not quite done with Maine by sending a storm that dropped five or six inches of snow. 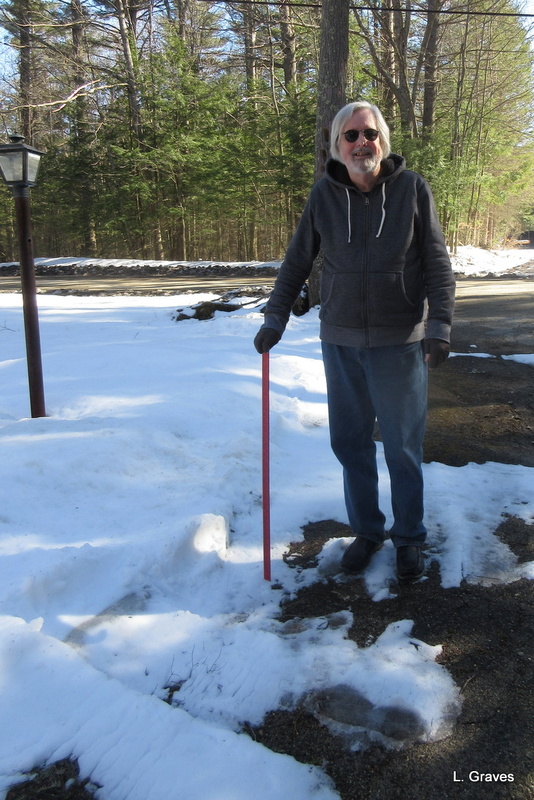 Once again, Clif had to take Little Green out for a spin, and once again, the town’s snowplow left a tall, hard ridge of snow at the end of our driveway. The week before, the backyard was free enough of snow that I had hopes of starting to pick up the many sticks that have fallen over the winter. But no, nature had other plans. No picking up sticks for me, no getting a whiff of spring. Here is Snow-Gauge Clif in the backyard. And here he is in the front yard. Despite the snow, Clif still looks perky. After moaning about Winter and its bony grip, I thought I would balance this post with something that’s making me oh so happy. 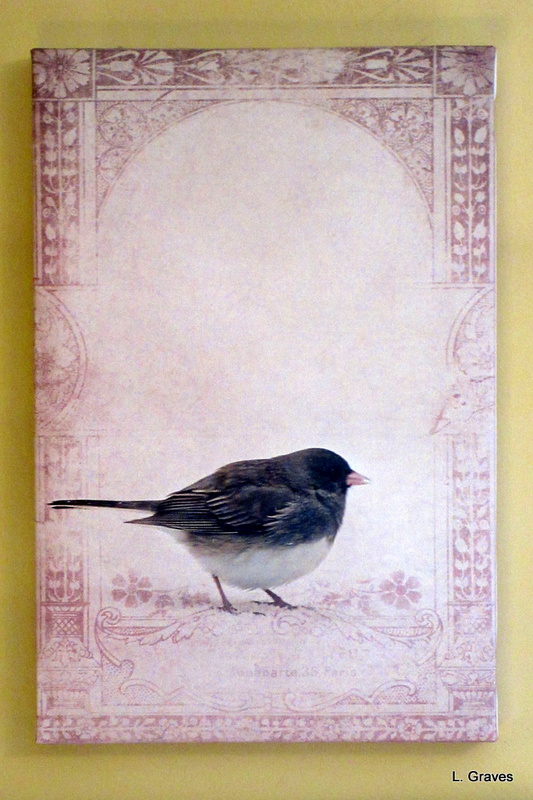 It’s a picture of a junco—birder lovers, please correct me if I’m wrong—that I bought at a craft fair last week. Clif and I were at the fair with our books—we did well!—and right across from us sat a talented photographer named Norma Warden. I chatted with her for a bit, and Norma told me she recently moved to Maine from California. She is unfamiliar with the Maine craft fair scene, and I gave her a few tips. After spending the morning and part of the afternoon admiring Norma’s work, which blends photography with a painterly sensibility, I bought one of her pictures. Birds and art are two of my weaknesses, and when they are combined at a good price, who am I to resist? The picture is hanging on the wall by my desk, and every time I look at that little bird, I smile. Here is a link to Norma’s website, where you will find her lovely art selling for amazingly reasonable prices. I feel your pain Laurie – I’ve been so grumpy about all the cold and wet we have had, making it feel like a very long winter – but I must get a grip – you have it much worse. And we have just had a couple of lovely sunny days. Hoping to send some your way. Love your bird picture – fascinating combination of skills – so perky and calming at the same time. Yes, perky and calming at the same time. Great description. Sorry about your disappointing weather. Oh I do hope spring comes for you soon! Still, even with the new snow, it is a lot less than last time you posted. And tomorrow is supposed to be the warmest day yet this year. There is hope! Well done for doing well at the book fair. You needed something to cheer you up after yet more snow. So sorry about the grump-inducing weather. But so glad you did well at the book fair! Not sure if I’m allowed to post a link in here or not – but this is the song. Clare – Isn’t it the best? I still can sing right along with it. Thanks, Jodie! The link came through just fine. I’m shocked that link worked. Anne didn’t tell me herself that this was the bird she sang about. I really don’t know where that came from. But it’s my story and I’m sticking to it. Oh, I love Juncos! They are a sweet little bird. I’m not sure if we have them through the summer or not, but I know they are around in the winter. Nice! Spring will come, I know it will, I know it will!! Focus on Act II! That’s where the happy ending is–a good craft show, a lovely new picture, and the knowledge that spring *must* be approaching! It’s good to have a pretty picture to cheer yourself up…spring must be coming soon..! Spring *is* on its way to you, Laurie. We are supposed to have spring here but we have frosts every night and I was beaten about the head by hailstones twice today! I love your pretty Junco picture and well done for your success at the fair! Thanks, Clare. Spring is coming, albeit slowly. That’s a lovely chubby little bird – I don’t believe we have them in Europe. Sending you a bit of our sunshine from S.W. France. Merci! And, yes, juncos are sweet, little birds. I love seeing them hop around the feeders in our backyard. Well at least there is happy as well as droopy. I hope the winter disappears soon – we are currently suffering from cold east winds (from Russia), but apparently it’s going to warm up at the end of the week – I can’t wait! Fingers crossed for you! 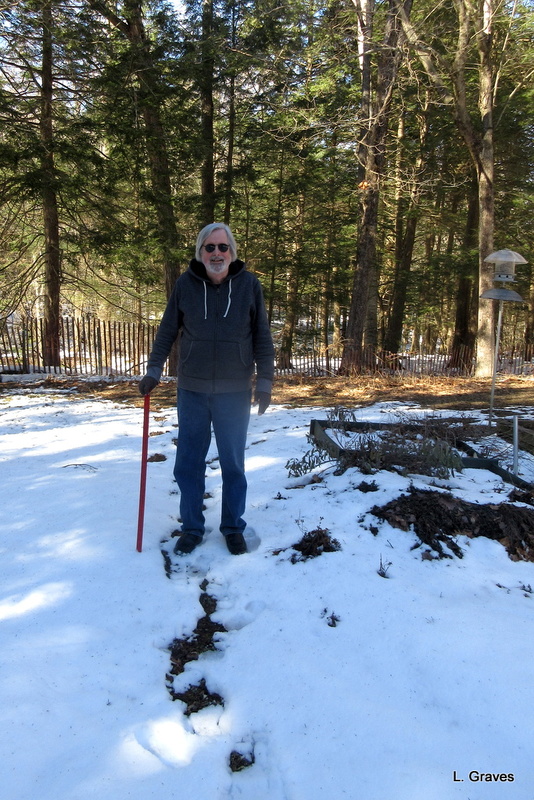 As for our snow…it is melting at such an astonishing clip that this week might be Snow-Gauge Clif’s last week. Our winter Junco’s must have headed north recently, as I have not seen them for a few weeks, since our last snow event. We are enjoying a colorfull Spring with 70F days (between rain storms). It’s coming your way. Many thanks! Same here in Maine with the weather. Lovely bird! Will check the photographer’s site. Worth checking! So reasonably priced.